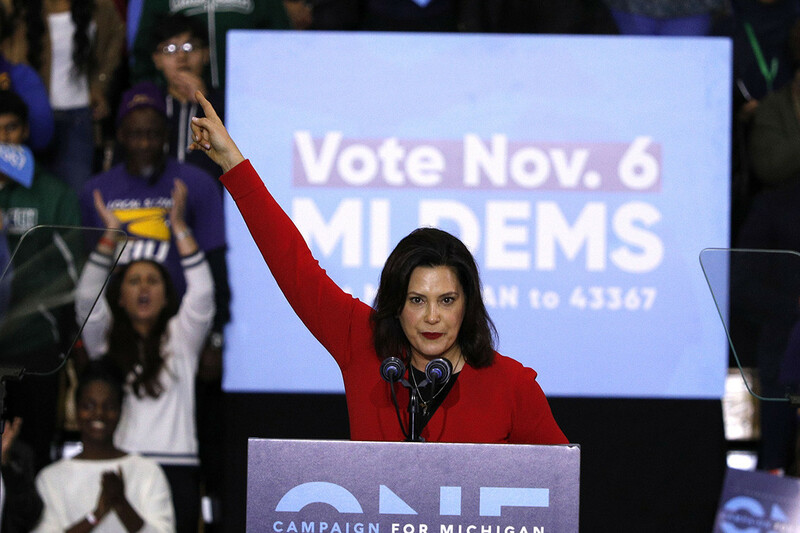 The governors of Michigan, Pennsylvania and Wisconsin urged 2020 Democrats to seek consensus — and to visit their states. The class of Democratic governors that swept to victory in three key Midwestern states have some advice for Democratic presidential candidates: Keep it simple. Don’t overpromise. And most important, don’t ignore their states. Democratic Govs. Gretchen Whitmer of Michigan, Tom Wolf of Pennsylvania, and Tony Evers of Wisconsin aren’t known for fiery rhetoric. But in interviews with POLITICO on the sidelines of the National Governors Association’s winter meetings, the three Democrats — all from states President Donald Trump pried out of the Democratic presidential coalition in 2016 — stressed in uncharacteristically pointed language the importance of drilling down on issues that affect people every day, like health care, education and infrastructure, to reassemble a winning Democratic electoral map in 2020. The governors’ incremental recommendations put them at odds with the ascendant left in the Democratic Party, which is pushing expansive environmental and health care policies like the “Green New Deal” and Medicare for all. But most of all, Whitmer, whose direct “fix the damn roads” campaign slogan helped her to an easy victory in 2018, said 2020 Democrats need to start just by showing their faces in the states that sent Trump to the White House. Hillary Clinton infamously spent little time campaigning in Michigan or Wisconsin after the primaries in 2016. Wolf, who coasted to a second term in Pennsylvania, said Democrats need to make that face-to-face pitch to rebuild trust in their party. Evers, the former education superintendent in Wisconsin who beat Republican incumbent Scott Walker by fewer than 30,000 votes last year, urged fellow Democrats to home in on health care, education, and infrastructure — and not to promise the moon. “I think the important thing for me is someone that is willing to address those issues in a proactive way but also make people feel comfortable that they can actually accomplish something,” Evers said. Winning back these three Midwestern states, which went Democratic in six straight presidential elections from 1992 to 2012 but flipped to Trump by less than 1 percentage point apiece in 2016, is the clearest path back to the White House for Democrats, though the party will also target some fast-changing states in the South and Southwest. Democratic Sen. Amy Klobuchar has made her electoral success in Minnesota a key piece of her campaign, while appealing to white working-class Midwesterners is central to the rationales of Sen. Sherrod Brown (D-Ohio) and former Vice President Joe Biden as they consider presidential campaigns. They would face intense competition from more strident ideologues in the Democratic presidential field, as did the governors now offering their advice to the candidates. Evers was never regarded as the most exciting candidate among eight in his Democratic primary in Wisconsin last year. Whitmer, meanwhile, fielded criticism for being too conservative on health care compared to her opponents for the Democratic nomination in Michigan, and Wolf has forged a relatively low national profile in his fifth year as governor of Pennsylvania, where he has largely stayed out of intra-party policy fights. But even as their party gears up for an ideological and potentially divisive presidential primary, the governors preached unity among Democrats. “I don’t think there’s a big fundamental disagreement of what we ought to do,” Wolf said. Evers noted that health care was a winning issue for Democrats of all stripes in the midterms. “I’d continue that,” Evers said. Their states have not gotten a huge amount of personal attention from Democratic presidential candidates so far this year, though Klobuchar recently made a stop in Wisconsin. But Whitmer said she will offer as much help as she can to candidates who want to come to her state.